Wow. You actually did it! You see, over the next couple days, I will be checking my Adsense to see how many people will come to this website due to my "Destiny game review". And where as I will probably get a couple dollars due to traffic from supportive/curious fans such as yourself, the fact remains that on most any given business website...say like Bungie.net; web traffic = money. In one way, shape, or form. Whether it be from user traffic, app downloads, or created user accounts. Traffic is $good$. And so therein lies the point. 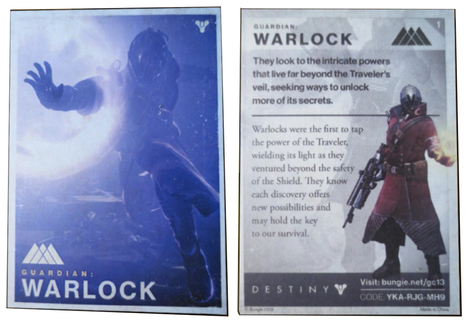 Bungie will make money not only in "Destiny" game sales, but also in website traffic from the millions of people wanting to read content they have unlocked in the game in the form of these grimoires. Keep in mind this will not be a one time occurrence. Any new grimoires that are unlocked will require the player to check back on Bungie's website if they want to read what it has to say. One can't help but see dollar signs in the eyes of the Bungie "higher ups" at the thought of the revenue this will bring. This doesn't even factor in the 2 DLC packages slated for release in the coming months. That's right folks; 3 flowing rivers of cash from 1 under developed game. After all, why sell 1 solid game for $60 when you can sell 1 incomplete FPS game for $60 that will sell from the Bungie name alone, then bathe in the honey that is web traffic revenue and milk more cash from your fans from that DLC they think they need simply to have what their parents used to call a "full game experience"? Welcome to the modern age in game marketing! the grimoirs were awesome, i kept saying out loud "why wasnt that in the game"
I am sick and tired of the constant trend of incomplete, unfinished, and/or chopped-up DLC in AAA games. LOL I was watching the video and when you used going into the decription as a explanation on what you were trying to get at I thought wait......Did he actually then looked and went well now I have to see this. but i thought, websites get money only when i click on the ads! can you review kingdom hearts? Quick Question: If I use adblock do you still get money from the hit? Just curious. Thanks. One of the reasons why I love Final Fantasy XIII was the data log, I honestly can spend hours reading it. If you make an interesting world I'm in. But for me I better still be in that world when I'm reading up on it. Hey Man! you make Awesome reviews, I like watching watching your vids. My bestfriend is a HUGE Fan; if I get some sort of of personal message or if you add me in facebook or something I can only imagine his reaction. It's alright if you're not up to it thought; you're still awesome. Get the best gaming experience rewards by visiting the best bettingrewards.com.au website. Although we are at pre-launch stage, we already developed the infrastructure that can bring in revenue for you right away. Please let me know if you are interested to learn more. Jeremy, you owe it to yourself to check out Stranger Things, Netflix series. A kaleidoscope of 80s movies like E.T.,Goonies,Stand by Me and Firestarter to name a few, all influenced to a new story that is very fun. To add to the effect, it takes place in early 1980s and most every effect is practical. I promise you, it's sooo much fun! can i get a tone check? You also need here your group of closest friends or family. Ask them for help in cleaning up your house and of course, keep in mind that you should pay them back when they host their own House Party Items.